Bhu Devi signifies forbearance and endurance. Neela Devi is the epitome of infinite love to God.
. Andal is the abode of all three; forbearance, love and compassion. One fine morning Periyazhwar heard a sweet cry of an infant admist his tulasi plantations. Immediately he rushed to find its source. Lo and Behold, he found a lovely girl baby in the midst of the tulsi plants. He fondly took home the baby and named her Goda. Goda grew up to be a beautiful, devoted, skilful girl. Periyazhwar continuously recited to her the stories of Lord Krishna and his transcendental pastimes.Andal thence fostered madhura bhava ( The devotion of a lover to her beloved) towards the Lord. She wanted to marry the Lord. While her relatives discouraged her devotion and regarded it as baseless Periyazhwar nurtured it. He advised her to follow the pavai nombu during the month of margazhi ( December-January). 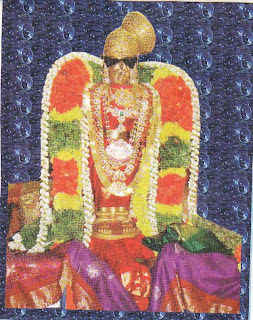 Goda immediately began the tiruppavai nombu. It was then that she composed the 30pavai verses beginning from margazhi thingal to vanga kaddal. Each tiruppavai is soaked with devotion and beckons to the world to “Awake, arise and attain the feet of the Lord.” Goda waited for the Lord to come to her and take her hand. She waited and waited but in vain. Finally it flashed to her that instead of her waiting for the Lord why cannot she marry Him of her own accord? Yes. This is what she proposed to do. One fine morning she adorned herself with the garland made exclusively for the Lord. Before none could see she wore it around her neck and sent it to the Lord through her father. Periyazhwar took it to the temple as usual and when the archakar ( the temple priest) was about it offer it to the Lord Lo! He noticed strands of hair. With uncontrollable anger he returned it to Periyazhwar who in turn took it back home with utmost agony. Goda was in despair again. Periyazhwar now made a new garland and took it to the temple premises again. This time the Lord spoke “ Periyazhwar, I will not accept this new garland. Bring unto me the same one which Goda adorned on her neck.” Periyazhwar was only too joyous to hear this and rushed to fulfill His command. The Lord accepted Goda’s garland and now her heart was filled with pride and merry. She became Andal-“ Shoodikodutha shudarkodi”. It was then that she dreamt of her Lord, Sri Ranganathar arriving on an elephant back and taking her hand in marriage. As dreamt in a few days the Lord did come to Srivilliputur, asking of her hand. The marriage was celebrated with great pomp and show. The couple had to now go back to the groom’s place- Srirangam. They all proceeded to Srirangam and as they walked towards the temple, Periyazhwar followed the stride with swiftness. Lo! The groom enetered the sanctum sanctorium and disappeared along with Andal. Periyazhwar beckoned to the lord to take him along. The Lord replied “ May you build a temple at Srivilliputur for Andal and me and conduct all the uthsavams as Andal did during her lifetime.” Periyazhwar did so with the help of VallabhaDeva Pandya King. Now this temple at Srivilliputur shines in all its glory.